Getting a grab bag of seasonal produce requires more weekly meal planning. 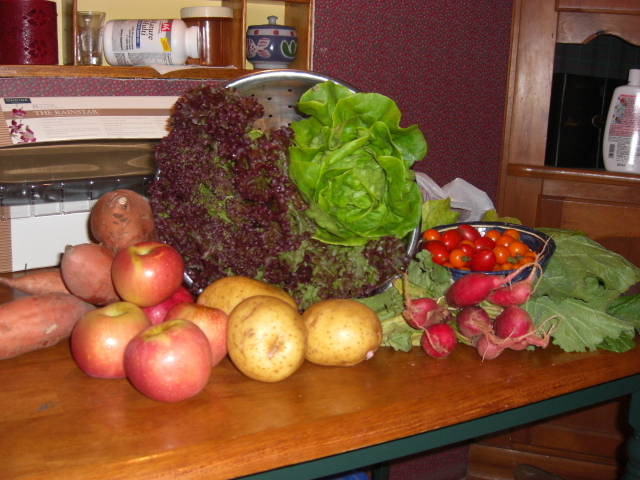 After all, you have to figure out what to do with all this interesting (and already paid for) food. .
Read the weekly CSA email. Patricia sends this around after the bags are delivered. It explains what’s in the bags, suggests some uses, as well as bringing up other CSA business like renewals and new drop-off locations. The preview emails are fun to read. But you never know what’s going to happen, and I’ve found it best not to plan for real until I have my bag. Who wants to plan twice? The preview emails are a good reminder to check the online store, though. If there’s something you really want to make sure you have or have enough of, you can order it before Sunday night. Schedule separate time for planning. Not much time – maybe twenty minutes. It often makes sense to combine this time with prepping. Both should be considered distinct from cooking. Otherwise, you’ll drive yourself mad trying to do it all meal by meal at 6:30 every night. Weekends work. If you can’t plan till the weekends, that’s cool. Just make your plan from weekend to weekend. 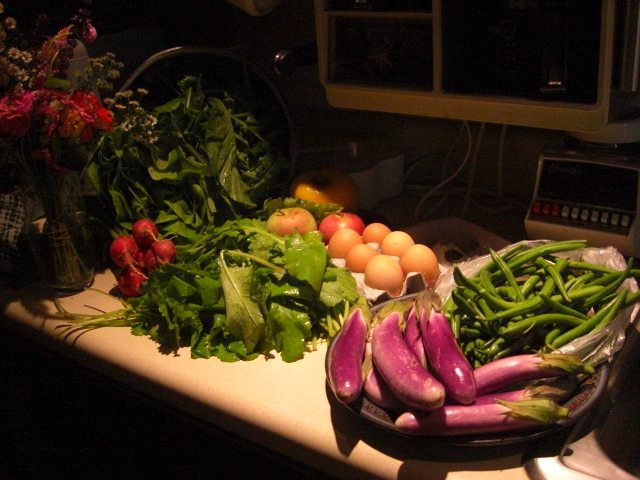 Your new fresh CSA produce will wait patiently in the fridge from Wednesday to Saturday with a few exceptions. Google is your friend. My laptop is one my favorite kitchen tools now. Just figure out what you’ve got and search for recipes. I still write out my meal plan longhand on a piece of paper, though, because I like to scratch out and draw arrows and make other notes. Then I make my grocery store list on the side and tear it off to take with me. Shop second. Try not to go to the grocery store until after you’ve planned the coming week. Then you have a plan and a list and will shop more efficiently. Cookbooks work, too. If you don’t have any useful cookbooks, see what your friends and relatives have. A lot of people end up with cookbooks they never use and might be happy to loan them out. If you want your own, here are a few recommendations. Find a style. Sticking to a style of cooking for a couple of weeks or even a season has a bunch of benefits. Find out more here. Before I joined Farmer’s Fresh, I never did much prepping. I’d chop some onions or potatoes now and then. But now I have a new job and you do, too – you are now your own prep cook. Sooner is usually better. But most stuff will survive until the weekend. That’s one of the beauties of CSA produce. It’s so fresh that you have at least a couple days breathing room over anything in a grocery store. 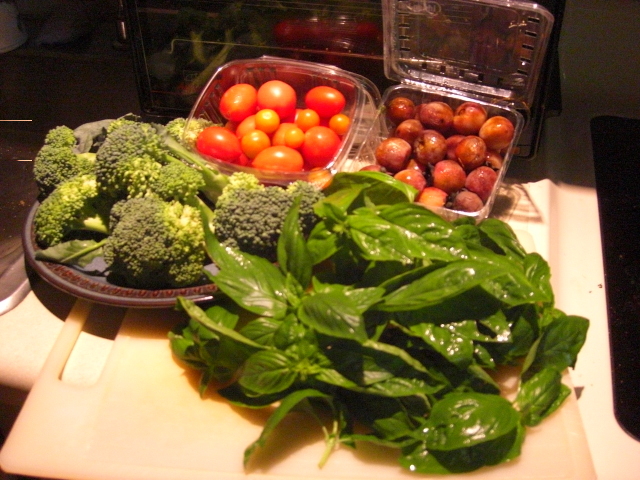 If you are looking for absolute freshness, you may want to delay prepping until right before cooking. But that doesn’t work for me. In the past, I used to look in the fridge and think, “I could put some (insert produce) in this dish, but I don’t have time to wash it and cut it up.” Boo! Now I wash and prep everything at the beginning of the week and have it ready to use whenever I want it. If I don’t, I’m likely to put off using it and that doesn’t do anyone any good. Any loss of freshness is totally worth it to me. Combine prepping and planning. When you’re washing and examining produce, it’s a great time to think about what it will be good for or with. Here’s more about meal planning. Keep prepping separate from cooking. Prep in mid morning or mid afternoon on the weekends or even later at night – far away from any eventual meal. There’s too much to do to prep and cook a meal at one time. And the energy required is completely different from when you’re cooking an actual meal. When you’re prepping you can let your mind wander, turn on the music or the tv, sing, or invite a friend or family member to come hang out. Even if they don’t help much, it will still be fun. When you’re cooking, it’s more about keeping track of different things and timing and what comes next. There’s not so much time for mind wandering. Get one or two good knives. A good knife can make prepping fun; a mediocre one will drive you insane. You simply have too much chopping, slicing, and dicing to do to muck around with a lesser knife. Other tools are important, too, but knives are paramount. Delegate. Once you’ve had some experience prepping, figure out what jobs you can pass on to others. Delegate Part II: One of the reasons I enjoy cooking for my family is that they clean up. Once the plates are on the table, my part’s done. I’m incredibly lucky, I know, that my husband just assumes this is a fair trade. But see if you can’t work something out. Focus on the fairness aspect and let them clean any way they want to. Well, almost any way. I finally had to stop biting my lip and explain to my husband that my wooden utensils can’t go in the dishwasher. Remember, even when you have to be your own prep cook, it’s still nice to have one. We got a cute bouquet in our bag today as a thank you from the farmers. I’m sure enjoying them in my kitchen. I also bought two additional bags of basil fro the online store to make pesto for freezing. Steam the broccoli lightly and then toss with butter, lemon juice, and pepper. Make salad with the lettuce and some of the arugula and mystery greens. Add in cherry tomatoes and sliced radishes. I have no idea what to do with wild persimmons – but they sure sound cool. Every week the CSA manager sends around a flyer about the week’s bags. I’m waiting for mine and hoping for some guidance. I found a recipe for arugula pesto. If we don’t eat it all up fresh or wilted in some recipe this week, that’s what I’ll do. The green beans look like they’d be great steamed like the broccoli. I’ll have to convince my husband that all green beans don’t need to be cooked to death to be edible. Eggplant parmesan was such a huge hit, I may have to try again with this batch. Check back later for an update! Here’s our first salad of the season. 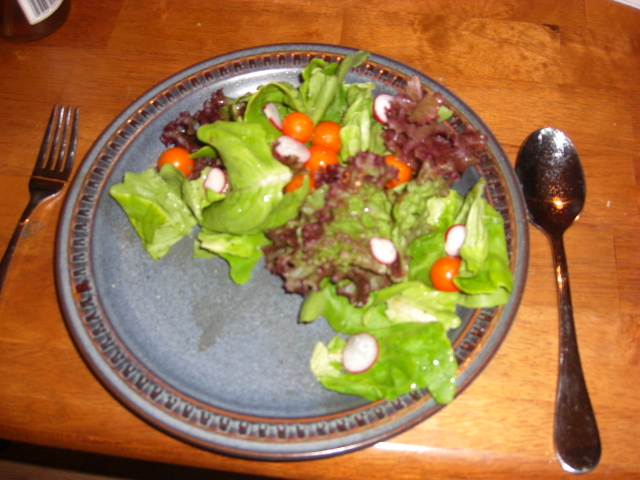 Two types of wonderful lettuce, cherry tomatoes, and thinly sliced radishes from my bag plus pepper, oil, and vinegar. 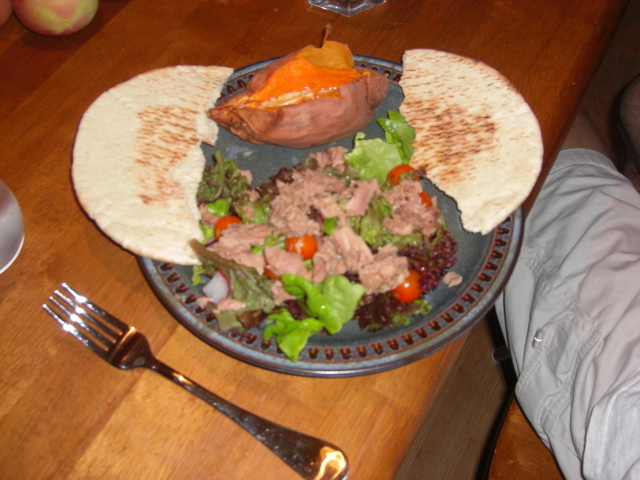 One trick I like is making the salad then adding canned tuna. (I like tuna in oil, so I hold the oil in the salad dressing.) Toss it all up and put it on plates and then put the plates in the fridge for 10 minutes or so. Chilling it all together makes it really nice. Unfortunately, I forgot to allow time to chill it for this meal. But the sweet potatoes were delicious. Not a bit tough or stringy like they sometimes are from the grocery store. I tried sliced radishes in salads and then roasted marinated radishes. Everyone liked the radishes in the salad better. You have to slice them really thin, though. Then they add just the right amount of crunch and peppery zing. Those pretty little apples were a kind of disappointing. They were very fresh and crisp but not as flavorful as I’d hoped. Still, they made a nice, crunchy afternoon snack. I made syrup from the lemon verbena as threatened. It turned out pretty well. It’s a nice change of pace from honey in my tea. Check out the goods! I was really excited to see the lettuce. This season I upgraded to a premium bag. So I’ll try to separate it out for reference. 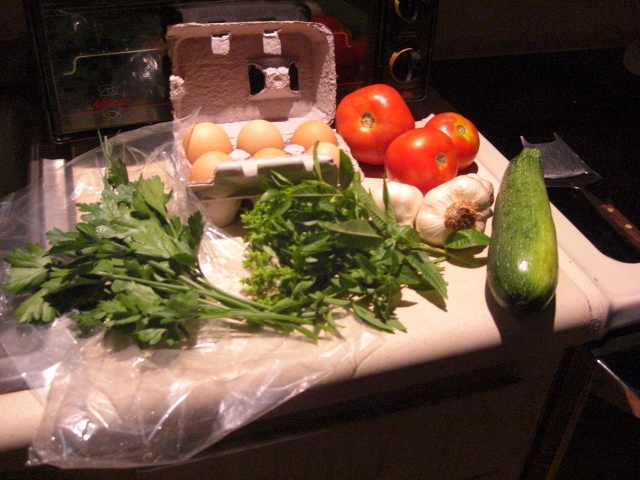 The above stuff is pretty much the standard bag according to our weekly CSA flyer, and below is the premium extras. 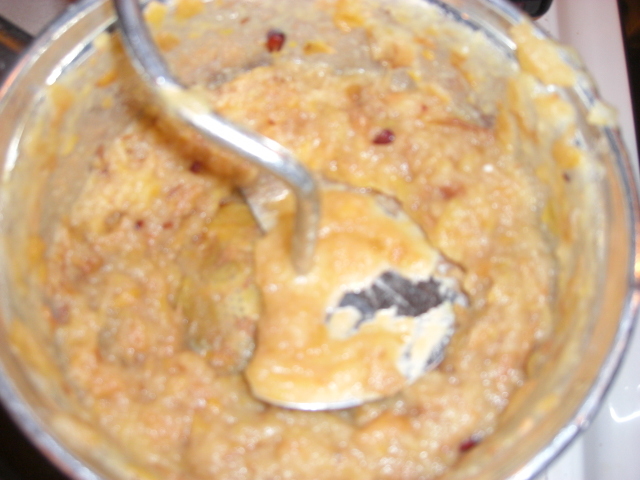 Potatoes (both sweet and white) will be baked in the microwave and eaten up. We’ll put some of the parsley and chives on the white potatoes. These apples are made for snacking. That is what they’ll do…. Radishes will get 1) sliced thinly and added to salads, and 2) chopped into little chunks tossed in Italian dressing and parmesan cheese and roasted in the oven or toaster oven. This makes a good, easy side dish. Cherry tomatoes will join the radishes in salads. They also might get sliced and put on pita crisps along with the parsley and chives. Big tomatoes. Hmmm. I might get a Vidalia at the store and make sliced tomato sandwiches. Or they could get cooked up with garlic for some Italianesque recipe to be named later. Greens will get cooked, chopped, and frozen to await their chance to become “spinach”-artichoke dip. I just made some dip last week and it’s one of those things you can’t eat all the time. Or they may wind up with my mom. She and my dad like greens a lot. Lemon verbena: I guess there is a Santa Claus! This week I got enough lemon verbena to try the lemon verbena syrup recipe I mentioned last week. I’ll let you know how it goes. I don’t have any big plans for the eggs yet. A lot of times we just make scrambled cheese eggs. Maybe we’ll try omelets with tomatoes and herbs. 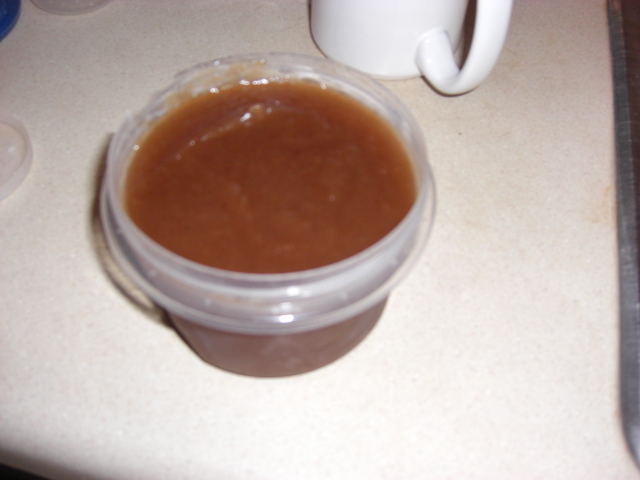 Last week I split a 10 pound bag of apples with my neighbor and decided to make apple butter. I used this recipe from Simply Recipes. Everything went pretty smoothly, but the end product was a little sweet for me. I’m going to cut the sugar by at least a quarter next time. I may try reducing the water a little, too, because it wasn’t as thick as I was hoping even after cooking a long time. One thing I really like about this recipe is you don’t have to peel or core the apples! You just wash and quarter them cutting out any bad spots. Cook in the water and vinegar till mushy and run them through the food mill. It took around 10 minutes to mill 5 lbs of apples. The smooth, buttery texture comes from using the food mill. 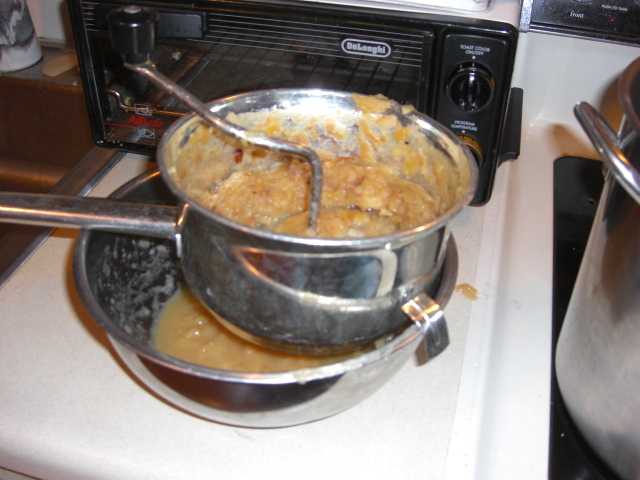 Supposedy if you use a food processor you just get applesauce. 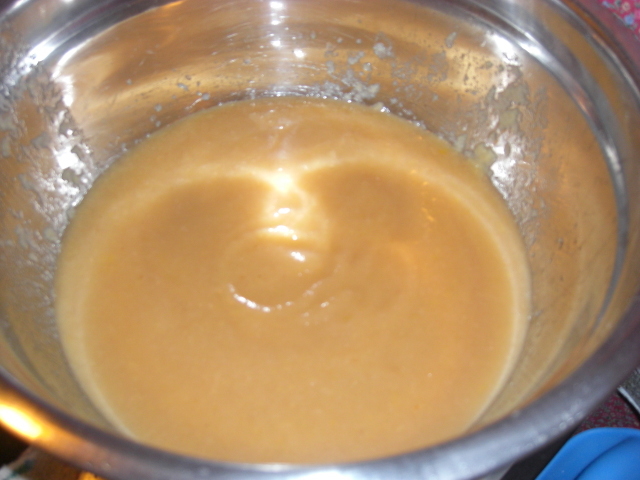 I cooked the apple butter for three hours over low and then a little longer over medium low while I sat in the kitchen with a book so I could stir frequently. It finally got thick enough for a wooden spoon to stand in, but not as thick as I was hoping. I’m not a canner (yet), so I’m eating some now, giving some away now, and freezing the rest for later. My favorite apple butter snack is a toasted raisin english muffin with yogurt cheese (or cream cheese) and apple butter. Mmmm. 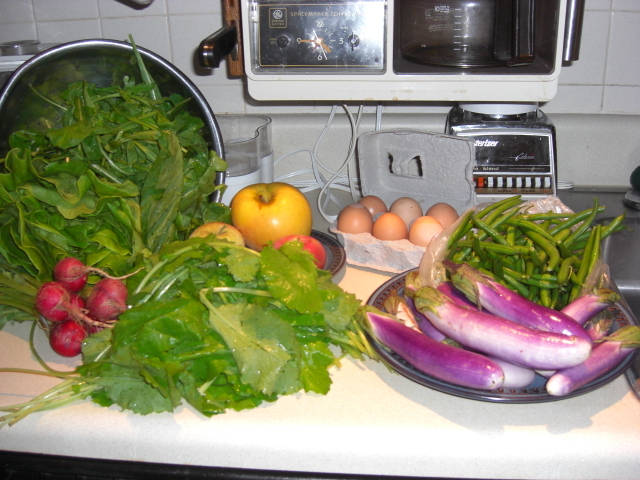 I’m ending the week a relatively happy camper (at least in terms of food and my CSA bag). And tomorrow should bring the season’s first lettuce. It doesn’t quite make up for the Dow, but it’s something to look forward to. The sweet potatoes were gone first. We just baked them in the microwave, and they were delicious! French onion soup was good, and we made enough for leftovers this week. But I forgot to use the savory! Lettuce leaf basil doesn’t last even as long as regular basil. I cooked it up with the tomatoes and some garlic Friday when I saw some of it already spoiling. Basil’s just one of those things you have to move fast on, I guess. 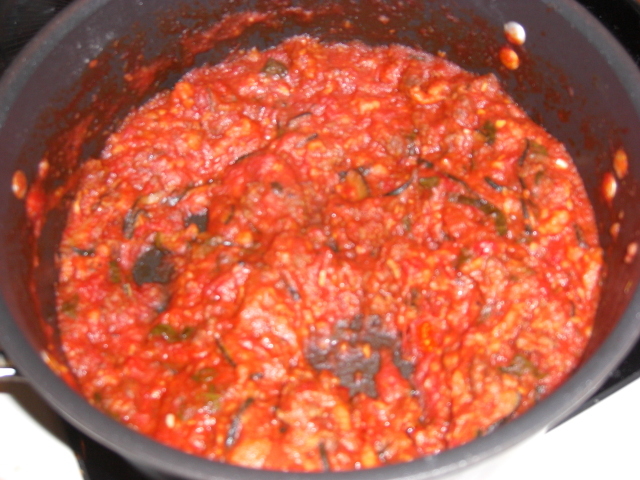 Once the tomato stuff was cooked, I put it in the fridge for the weekend’s big tomato-zucchini pasta dish. We were really pleased with tomato-zucchini-sausage pasta. I browned some Italian sausage and then scooped it out and cooked some sliced zucchini in the sausage fat. Then I added back the sausage, the tomato-basil concoction, a big can of crushed tomatoes and some Italian seasoning. This type of Italian cooking seems very forgiving. As long as everything gets cooked and ends up in a big, simmering pot and is served over pasta, it seems to be okay. The apple butter adventure turned out pretty well, too. Next time I’m going to cut the sugar by at least a quarter. Using the food mill was not as tedious as I had feared. The green beans are still in the produce drawer. Thankfully, they’re not as delicate as basil. I’m going to blanch and freeze them any minute now…. At some point this winter, I’ll be excited about green beans again. Lemon verbena, savory, and the Mexican tarragon all dried very nicely. I like loose tea, so it’s easy for me to just add a lemon verbena leaf to my tea whenever I make a pot. It’s really nice in the afternoon. I tried adding leaves to cold sparkling water, but they didn’t add much flavor. At some point I want to try making lemon verbena syrup which could then be added to tea or sparkling water or pretty much anything. Here’s a cool page with bunches of lemon verbena uses.